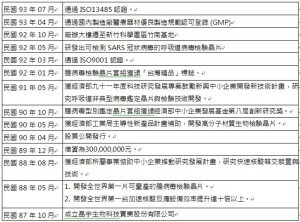 首頁 » 安心認證 » 晶宇生物科技實業股份有限公司 DR. Chip Biotechnology Inc.
晶宇生物科技實業股份有限公司 DR. Chip Biotechnology Inc.
DR. Chip Biotech Inc. was founded at the Incubator Center of the Industrial Technology Research Institute (ITRI) in October 1998, with the goal to develop low cost and high quality bio-medical products for clinical diagnosis. We continue improving and simplifying current biological research methods and clinical diagnostic tools to meet the demands of our customers. 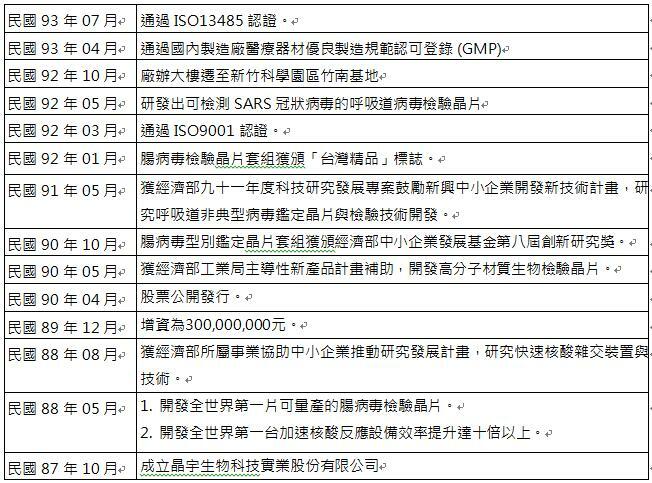 We have developed three technological platforms and filed about fifty patents in the US, EU, Japan, Australia, Taiwan, and China. Today DR. Chip develops and manufactures several biochip products, image analysis device and software, and biological reagents. We adopts the state-of-the-art facilities and total quality management systems for manufacturing to meet the rapid expansion and increasing demands of the market. To stand at the forefront of the biochip revolution, we adopt latest microfluidics and MEMS technologies for developing lab-on-a-chip system. DR. Chip currently collaborates with prestigious domestic research institutes and and many others in Europe, Australia, and great China.We are continuous applying our technology platform to the molecular diagnosis of pathogenic organisms, genetic and chronic diseases, and food safety inspection.